What the Boston Marathon Means to Bostonians- Especially This One | Fit Girl. Happy Girl. 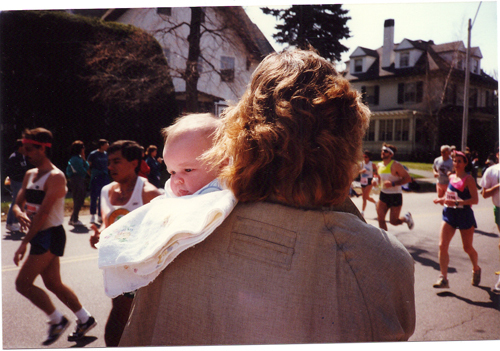 At mile 20 of the 1990 Boston Marathon, my Mom holds me as she watches for my Dad to run by. Long before running became such a big part of my life, running was in my life. 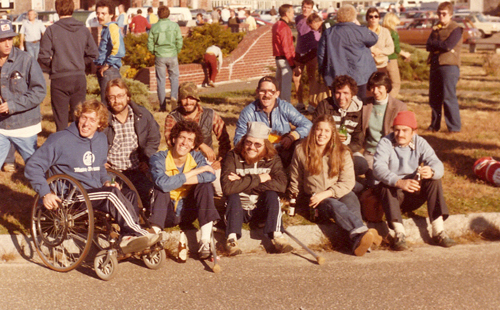 My Dad was a marathoner who ran the Boston Marathon religiously with his group of running friends, the Ragmen. They called themselves the Ragmen because they were a group comprised of half runners and half wheelchair racers, including one of the first wheelchair racers, Bob Hall. I was a baby when my Dad was coming to the end of his running career. That didn’t mean running stopped being a part of our family life though, because every year, on the third Monday in April, we would return to mile 20 of the Boston Marathon, Along with some of the former Ragmen, we would cheer on strangers, elites and friends as they made the ascent up Heartbreak Hill. Team Ragmen with my Dad in the blue and yellow jacket. The Boston Marathon is a tradition rooted in the lives of many Bostonians and my family is no different. Since infancy, I’ve been out on that course. My parents would always pack a cooler with sandwiches and drinks so we could spend hours out on the course cheering as endless waves of runners passed by. I’ve handed out fuel to runners with one of my Dad’s friend’s sons, aptly named Myles. We’ve made signs. Brought that morning’s Boston Globe with the list of bib numbers and names so we can cheer on friends or call out runners in need of support. I’ve handed out water and Gatorade. Even once, when I was little, I remember running alongside some of the runners as they passed by, wondering if I could do it too. But, in all those years, it never occurred to me that one day I would run a marathon. My Dad was a marathoner but for most of my life, I hated running. But now, in my 23rd year attending the Boston Marathon, I am a runner and about to become a marathoner after April 28. I’m returning not as a spectator this time but as an editor at Runner’s World. I won’t be at mile 20 this year but I’ll be in a pressroom near the finish line, not-so-patiently awaiting results and post-race interviews. It’ll be different this year but the tradition will still be there. In a video interview with Shalane Flanagan yesterday, she, a Massachusetts native, said it perfectly, “Boston is everything.” She grew up watching the marathon every Marathon Monday just as I have. She watched the elites in awe, she cheered on her Dad just like me and now she’s returning as the American female favorite. She called it a “full circle moment,” and I have to say I agree with her. Shalane’s full circle moment will be a “W” at Boston but for me, if I ever get a chance to qualify, that would be mine. Although I’m not even close to qualifying for Boston based on my training run times, I can still say being at the Boston Marathon on Monday will be special. I know my family and the remaining Ragmen will be at mile 20 cheering on the runners and I’ll be at the finish but I’m coming back a different person. As a spectator, I’ve always attached memories and nostalgia to being at the Boston Marathon but now, as a runner, knowing how hard these people worked to make it to Boston makes me appreciate it even more. But as a Bostonian, the marathon is so much more than an elite race, it’s our city’s shining moment. People say what sets the Boston Marathon apart from other major marathons are the spectators because no matter where you are on the course, someone will be cheering for you. And in Boston, that’s what we do best- we cheer for the pros, we cheer for the underdog and we cheer for the Ragmen, who is everyone else. Love your post! I am a Massachusetts girl and will be spectating with my Mom in Wellesley, something I did many years ago as a child. (we handed out orange slices!) As a relatively new runner (2.5 years) I now have the goal to qualify. I even wrote a post about it when I realized that my one and only marathon (run the day after a half marathon-Goofy Challenge) was within 29 minutes. Time will tell but it is a fun goal! Great post! I grew up watching the Marathon too and have some great memories of cheering people on along the course. And like you, now that I run I have a new appreciation for everyone’s efforts out there. I’m volunteering for the 1st time this year in the Athletes’ Village – can’t wait! What a great family tradition! I love that you guys have done the entire experience as a family: cheer, volunteer and run! Have fun making new traditions. First of all, you are living my dream life working at runners world. I would kill for a job like that. I grew up with a mom (albeit not a marathoner- she did halts) that would miss work every marathon monday to go cheer on the runners. That’s what I want to do someday. And eventually, be the one getting cheered on. LOVE THIS! I remember growing up in Boston and how it was such a huge event. I’m now training to qualify for next year so I can go back home and run! Love this post. What a great story about you and your dad. :) Running runs in the blood! I’m actually here in Boston. Nope, not to race although I wish I could say that soon. My husband and I just wants to take a glimpse of the event. It will definitely get us inspired to continue what we love doing! I’ve run the boston marathon 3 times and have to say its the most bone chilling experience with all the various forms of support…from the biker bar in the first few miles, to the deafening screams from the girls at wellesley that you can hear for at least a mile before you see them, to the frat boys offering beers, and just the overwhelming experience of being one of the lucky ones running the race. Best support ever. Thank you! Great post. I’m from Maine and was never interested in running. I think we watched some of it on TV a few times. When I moved to Waltham I went in to see the race once and it was exciting. Now I have run Boston five times, on invitational numbers, and I cannot wait to run again. I have several friends who will be running this year and I am excited for them. It is such a great race and a great event for the entire Boston area. I’m just watching the news and remembered this post. I hope that you’re OK. Please give us an update when you can! My thoughts go out to you and all the runners/spectators there today. Hey there, thank you for your concern. I was a block from the explosions when they happened. I was in lockdown in the pressroom until all was clear. Please keep those who were hurt or impacted by this tragedy in your prayers. Very glad to hear you are OK. All the runners and spectators are definitely in my prayers.